Who Were the 'Lizard People' of Los Angeles? 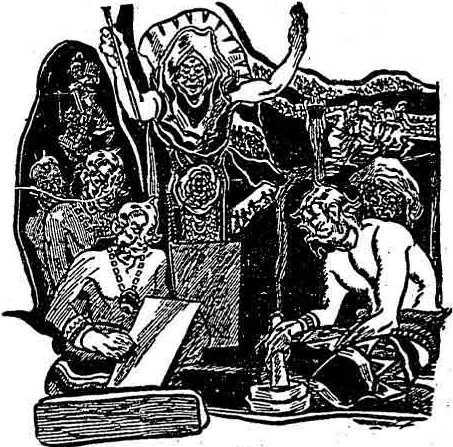 By Terrence AymLong before Los Angeles existed…long before the Spaniards built missions along the western coastline…and long before any European set eyes upon the Pacific ocean from the western shores of America, the Lizard People roamed the land—both above and below the earth. 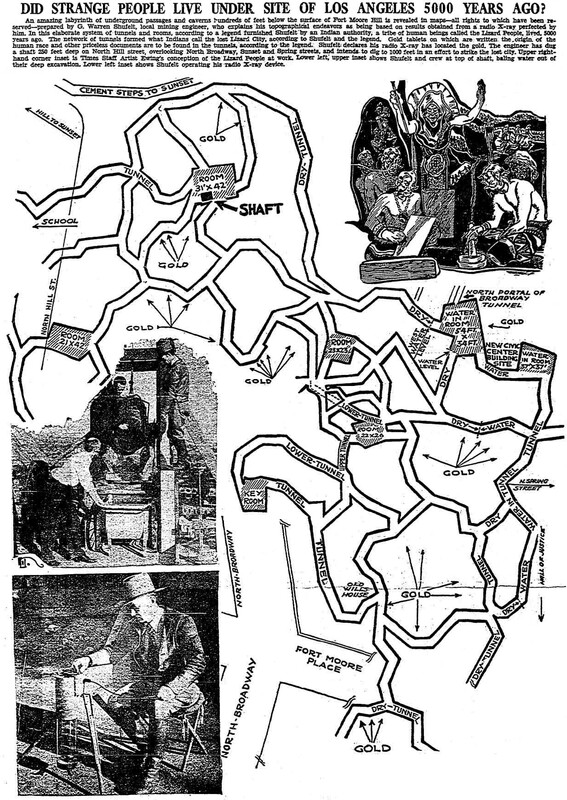 The Lizard People built a maze of intricate tunnels deep underground. Their subterranean passageways lay far beneath the earth for thousands of years until the tunnels were accidentally discovered in 1933 by a California engineer named G. Warren Shufelt. The engineer had invented an odd device he called a "radio X-ray." While prospecting for precious metals with the instrument he discovered a strange labyrinth of tunnels. Who were those mysterious people—those Lizard People of the underground realm? The Hopi Indians knew and related legends that provided some clues. When Shufelt learned that the Hopi Indians possessed knowledge about the strange tunnels he'd discovered, he traveled to Arizona and met with an elder of the tribe: Little Chief Greenleaf. Greenleaf (whose Westernized name was L. Macklin) shared an amazing tale with Shufelt. The chief told Shufelt that the L.A. engineer had stumbled upon one of the three great lost cities built along the Pacific coastline thousands of years in the past. Presumably,eons before the ancient Sumerian civilization rose 7,000 years ago, the Lizard People were already long settled in North America and had an advanced, flourishing civilization centered around trade between three giant coastal city-states. Greenleaf said that the remnants of the civilization that Shufelt found under the city of Los Angeles had been shelters built to protect the people from meteoric firestorms. Such a storm had destroyed parts of their cities when a huge fire came unexpectedly from the southwest.Comment: I mentioned this story a long time ago--on my website, before I had a blog. This 2010 article covers the same subject in more detail. I presume Aym got the story from the LA Times article he mentions--dated January 29, 1934. His article is mostly a rewrite of that article (below). 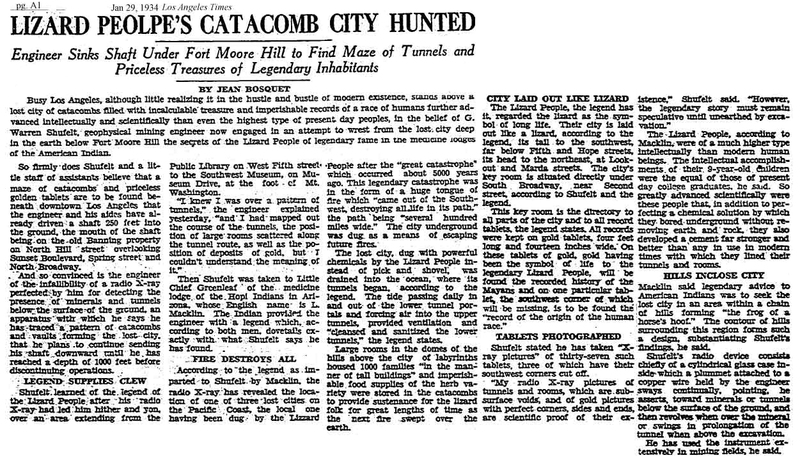 By Larry HarnischI thought it would be fun to explore the story of the "Lizard People," which is to say the excavations on Fort Moore Hill in an unsuccessful search for gold. G. Warren Shufelt usually gets the credit for the enterprise, but his partners deserve equal attention. The Times reported that Rex. I. McCreery and Ray Martin provided an ancient parchment map showing the Lizard People's underground empire, which allegedly stretched from the Central Library on 5th Street to the Southwest Museum, which you must admit is a lot of digging. Sept. 7, 1933: Shufelt, McCreery and Martin have given up, but Alfred Scott comes forward to carry on the search.Spaniards or Lizards? That wasn't quite the end of the story. Harnisch's roundup of LA Times articles continues:Dec. 22, 1938: Times columnist Ed Ainsworth takes a look at various legends of lost California gold as engineer Roger J. Adams begins digging. According to The Times' clips, a fair amount of dirt from Fort Moore Hill was used as fill during construction of Union Station. The job was done mostly by hand, with men using picks and shovels as a public works project to provide jobs during the Depression. Sept. 21, 1949: Demolition of the Broadway tunnel failed to reveal any buried gold.This certainly is a colorful story. But "Little Chief Greenleaf" isn't a Hopi name, so the Native portion of it rings false. No doubt someone concocted the whole "Lizard People" thing. Shufelt may have invented the so-called Hopi legend himself. Perhaps he felt a need to explain his failures--e.g., "The tides washed out the Lizard People and collapsed the tunnels." Or perhaps people weren't paying enough attention to the and he felt a need to spice it up. For more on lost civilizations, see Lost Mesa in Fablehaven and Indiana Jones's Criminally Bad Archaeology. Lizard people? Is this David Icke?